(BOE is barrels of oil equivalent.) As you can see, most are state-owned companies. Russia re-acquired its privately-owned companies. Saudi Arabia has increased its production 28% in the last 10 years. Iran, despite the embargo, has increased its production by 24%, in part because of increased export of natural gas. Venezuela’s production has suffered from politicization of its national oil company. Shell’s efforts to increase production by acquiring a position in U.S. shale plays has not been successful. BP has sold off a substantial part of its production. China has invested big-time to fuel its economy. And the world economy has managed to survive $100 oil. 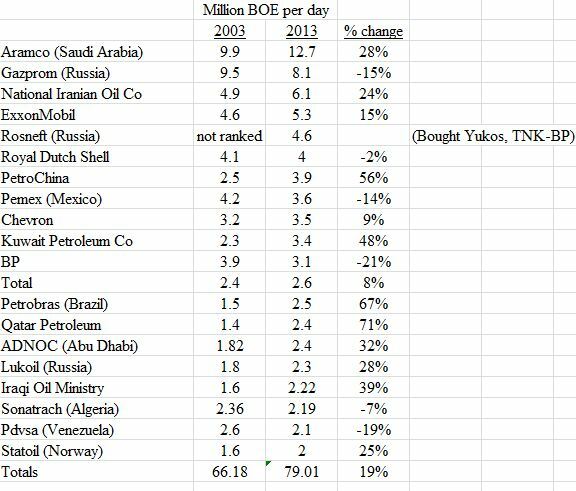 For comparison, the total world production in 2010 was about 137 BOE/day. These top twenty companies together produced about 60% of that total. For a good article on these numbers, see Forbes’ article, The World’s Biggest Oil Companies – 2013, here.